05/20/2005. The tile layout plan for the kitchen backsplash. Combination of white ceramic and blue glass tiles..
05/20/2005. The tile layout plan for the entry landing. Porcelain simulated slate tile. 05/20/2005. The tile layout plan for the top landing. Porcelain simulated slate tile. 04/14/2005. My revised paving plan. 08/04/2004. Architect's latest version. North & west elevations. 08/04/2004. Architect's latest version. South & east elevations. 08/04/2004. Architect's latest version. Site/roof plan. 08/04/2004. Architect's latest version. Second floor plan. 08/04/2004. Architect's latest version. First floor plan. 08/04/2004. Architect's latest version. Ground floor plan. 08/04/2004. Architect's latest version. Second floor electrical plan. 08/04/2004. Architect's latest version. First floor electrical plan. 08/04/2004. Architect's latest version. Ground floor electrical plan. 08/04/2004. Architect's latest version. 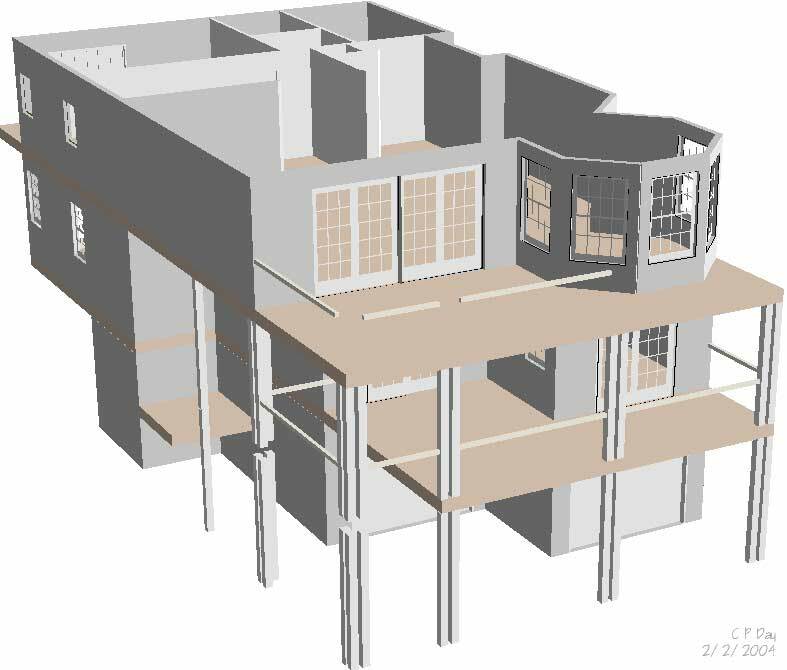 Building structural section views. 08/04/2004. Architect's latest version. Typical wall section views. 08/04/2004. Architect's latest version. Roof structural details. 07/30/2004. My VectorWorks plan for the landscaping. Just includes pavers and the walkway at this stage. 04/09/2004. My own CAD version of the north elevation. I'll use this to test many of the trim and finish options. Currently, we're deciding how to best configure the 1st & 2nd floor arches on this side. 04/07/2004. The revised north (front) elevation. 04/07/2004. The revised roof and lot plan, now with electrical and other details. 03/15/2004. Animation of house exterior. Lacks some windows, railings & roofs. Better animations will come soon. 02/27/2004. The second version of the second floor plan. 02/27/2004. The second version of the first floor plan. 02/27/2004. The second version of the lower level plan. 02/27/2004. The east (ocean side)elevation , shown for the first time. Entry stair is open design with railings. Stair tower windows will change. 02/27/2004. The west (facing the Boulevard) elevation has changed significantly in a month. 02/15/2004. Lee Avenue lot, current setbacks and existing house, which clearly could not be built today in the same place. 02/15/2004. Lee Avenue lot and new house drawn within setbacks. It must be about 15 ft farther from Lee Ave than existing house. 02/02/2004. West side elevation (facing Long Beach Boulevard). I've made edits to bath windows and mid-level porch based on our discussion. 02/02/2004. My Vectorworks model is taking shape. Here is a view from the northeast.